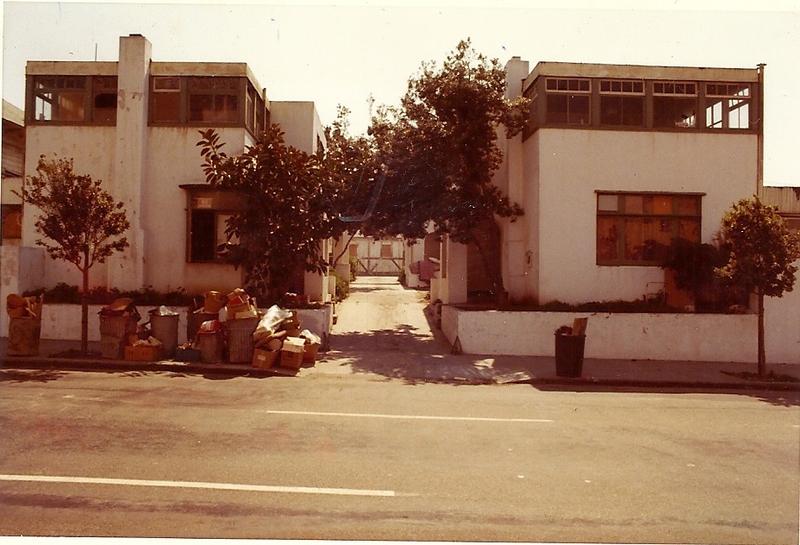 AT THE BEGINNING OF 1973, I REDISCOVERED IRVING GILLS HORATIO WEST COURT APARTMENT COMPLEX IN SANTA MONICA CALIFORNIA BUILT IN 1919. AT THE TIME A POTENTIAL BUY. 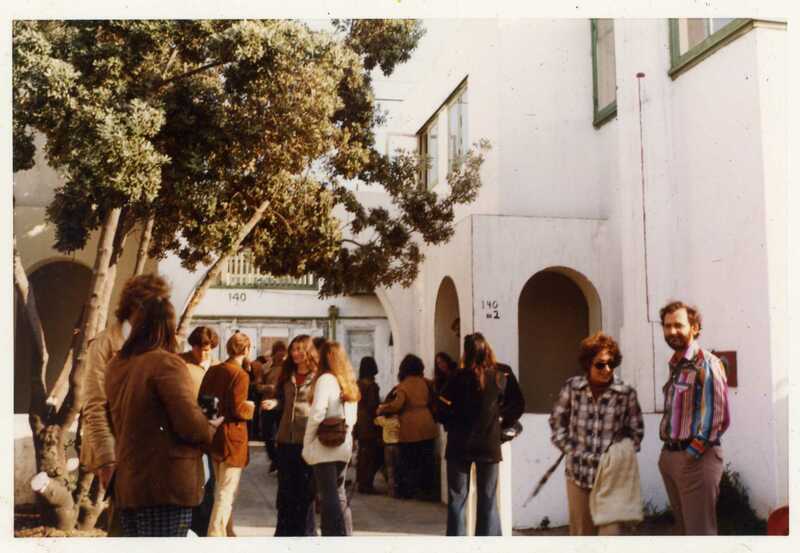 WE HAD STARTED SCI-ARC IN THE FALL OF 1972. I HAD COME OFF A DIVORCE THREE YEARS PRIOR AND WAS LIVING WITH MILICA DEDIJER, ARCHITECT , WHO BECAME MY SECOND WIFE , IN A WALK STREET COURT APARTMENT IN VENICE, WITH RENT INCREASES. 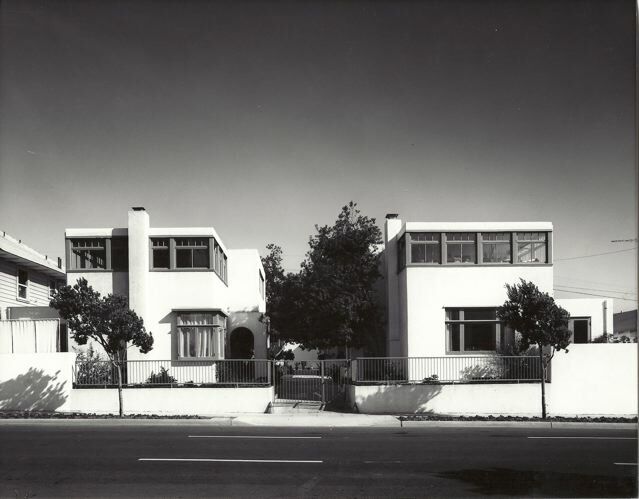 I A BIG FAN OF HISTORICAL MODERN ARCHITECTURE HAD READ FIVE CALIFORNIA ARCHITECTS BY ESTHER MC COY, ONE OF THE ARCHITECTS BEING IRVING GILL. I LEADING A LOSING CAMPAIGN TO SAVE A BERNARD MAYBECK PACKARD SHOWROOM IN DOWNTOWN LA IN 1962, MAYBECK ALSO IN ESTHER’S BOOK. THE APARTMENT COMPLEX WAS RUN DOWN AND OWNED BY AN ELDRLY GENTLEMAN THAT WAS IN BAD PHYSICAL CONDITION. HE WAS A SLUM LANDLORD. HIS COUSIN FROM FRANCE FLEW OVER TO ASSIST HIM IN CLOSING THE DEAL WITH US. IT WAS RUMORED THAT BOB DYLAN LIVED HERE BRIEFLY. THIS WAS THE HEIGHT OF THE HIPPIE MOVEMENT. 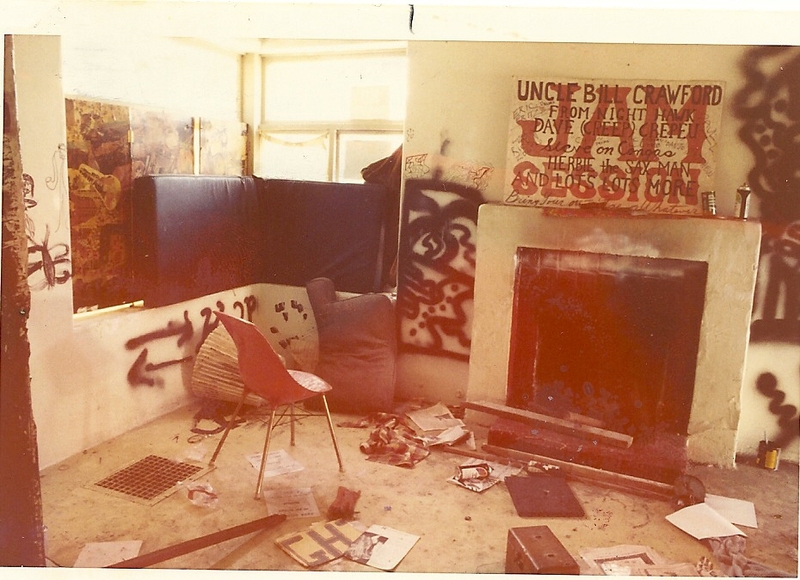 THE PROPERTY WAS A FLOP HOUSE WITH ALL SORTS OF WEIRD THINGS HAPPENING AND A KNOWN POLICE RECORD FOR CRIME. AFTER MOVING IN, FOLLOWING THE PURCHASE, MILICA AND I WERE ALARMED BY A POLICE RAID ON THE ROOF OF OUR HOUSE. THE WORD WAS NOT OUT THAT THINGS HAD CHANGED. HEROINE NEEDLES WERE COMMON, AND THE OCCUPANTS HAD USED LIT OPEN GAS PIPES FOR HEAT. THE OWNER GAVE ME A PRICE THAT HE WANTED FOR THE COMPLEX AND A TRADITIONAL TWO STORY BEACH COTTAGE NEXT DOOR. IT WAS MORE THAN WE COULD AFFORD, SO WE WENT LOOKING FOR PEOPLE TO BUY A QUARTER EACH AND HAVE A DETACHED HOUSE TO THEMSELVES. THE BEACH COTTAGE HOUSE NEXT DOOR PROVIDING PARKING IN THE BACK YARD. MICHAEL FOLONIS, A RENOWN ARCHITECT NOW, THAT WAS A STUDENT AT SCI-ARC, RELATED TO ME RECENTLY, THAT HE AND HIS YOUNG WIFE, WERE STANDING ACROSS THE STREET FROM THE ABUSED PROPERTY CONTEMPLATING WHETHER BUY INTO THE GROUP, WHEN A DRUG DEAL WENT DOWN RIGHT IN FRONT OF THEM IN BROAD DAYLIGHT. THAT CONVINCED THEM TO PASS ON HORATIO WEST. I OFFERED ESTHER MC COY TO BUY IN, BUT SHE WAS ELDERLY AND IT WAS TOO MUCH TO HANDLE. PETER DE BRETTEVILLE ARCHITECT HAD ANOTHER GROUP THAT WAS LOOKING AT THE PROPERTY AS WELL, BUT EVENTUALLY BUILT A NEW COMPLEX. DANILO AND MARGARET BACH LEFT THAT GROUP TO BUY IN WITH US. DANILO BEING A YOUNG SCREEN WRITER, MARGARET AN INTERIOR DESIGNER AND COMMUNITY ACTIVIST NOW. MY MOTHER, WHO PUT UP THE MONEY FOR MY SHARE WAS SHOCKED AT THE DEPLORABLE CONDITION. HAMLIN EMORY, A DOCTOR IN OUR VENICE COMPLEX WAS FEARLESS AND BOUGHT IN AS WELL. STEVEN SCHMIDLE, A WILD FUN LOVING HUNGARIAN ARCHITECT THAT MILICA KNEW, JUMPED AT THE CHANCE. HIS BEING THE FRONT UNIT ON THE OCEAN SIDE. A BAG WOMAN LIVING IN HIS HOUSE HAD STACKS OF STUFF TO THE CEILING. ONE MANEUVERED IN NARROW PASSAGES THROUGH THE JUNK IN THE ROOMS. pre restoration project my red carmen Ghia i am on the right in the leather jacket bought in mexico. many thanks to margaret providing most of the photos in this blog. 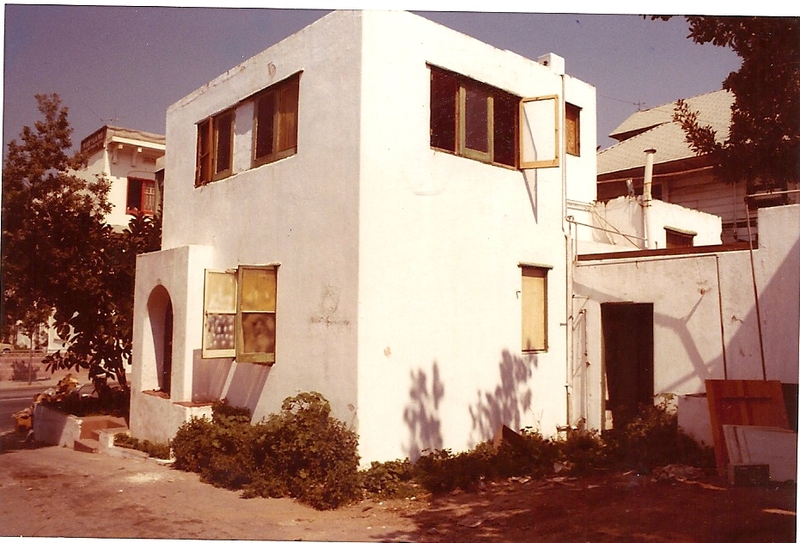 WE WERE FORTUNATE THE COMPLEX WAS BUILT OUT OF CONCRETE AND THE MAJOR WALLS AND FLOORS WERE IN TACT. WE MET AS A GROUP AND DISCUSSED HOW WE WERE GOING TO REMODEL. THE BIGGEST PRIORITY WAS TO RESTORE THE BEACH COTTAGE NEXT DOOR AND REAR UNITS TO RENT. WHICH BECAME MY JOB WITH ASSISTANCE FROM LIMITED UNSKILLED HELP FROM THE GROUP AND A CARPENTER BUDDY . AS WE WERE NEARING COMPLETION OF THE PROJECT, OUR RESTORED HORATIO WEST COURT APARTMENTS WERE FEATURED IN AN ARTICLE IN PROGRESSIVE ARCHITECTURE BY ESTHER MC COY. ALL OF THE RESTORATION WORK WAS DONE BEHIND CLOSED DOORS AND ON SATURDAY FOR MAJOR CHANGES, LIKE RIPPING OFF AN ENCLOSED PORCH ON THE BEACH COTTAGE, SO THE BUILDING DEPARTMENT WOULD NOT GET INVOLVED. 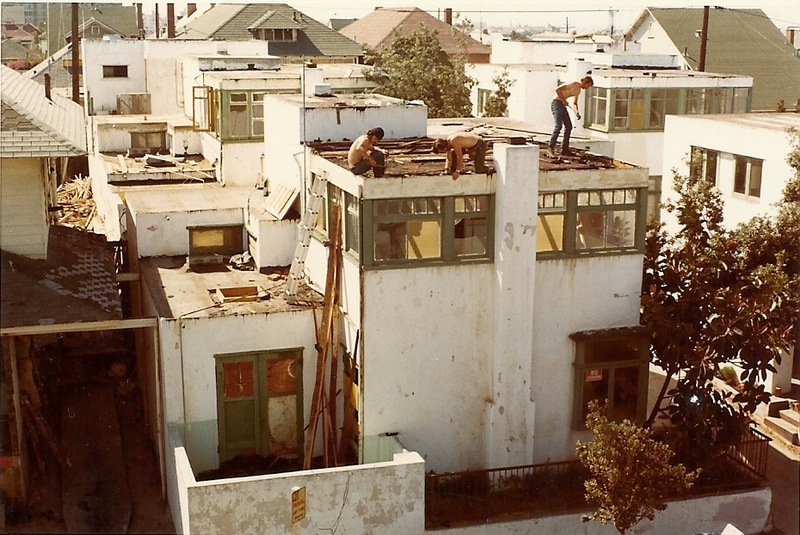 TO MY SURPRISE AFTER THE ARTICLE APPEARED, A SANTA MONICA BUILDING INSPECTOR APPEARED, VERY PROUD THAT HE HAD READ IN PROGRESSIVE ARCHITECTURE OF THE RESTORATION. HIS RED INK CORRECTIONS MINOR, SINCE THE RESTORATION CLEANED UP A SLUM BUILDING COMPLEX AND RESTORED A SIGNIFICANT ARCHITECTURAL MASTERPIECE. 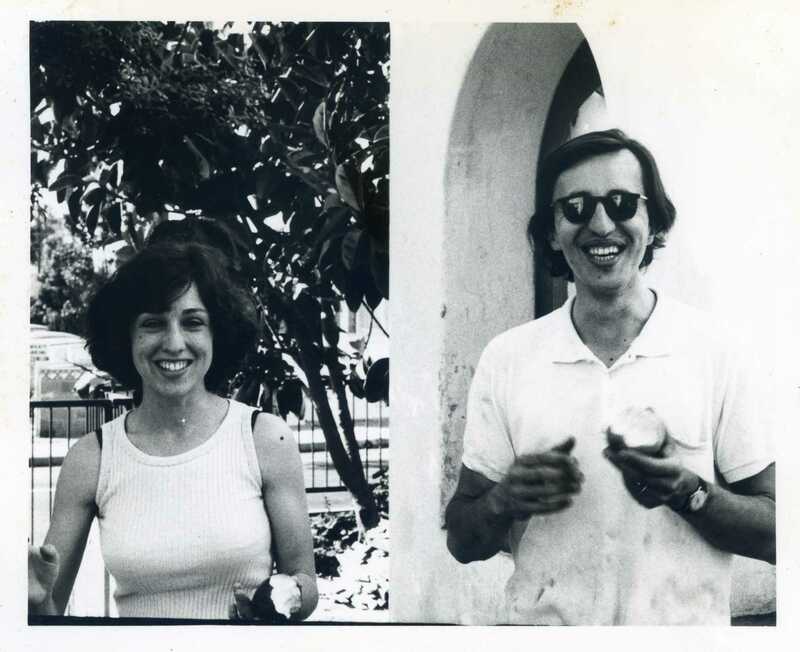 JANE FONDA AND TOM HAYDEN LIVED LESS THAN A STONES THROW BEHIND US. ALL LIBERAL AND CORRECT. WE VISUALLY HUNG OUT WITH JANE ON OUR PUBLIC BEACH. 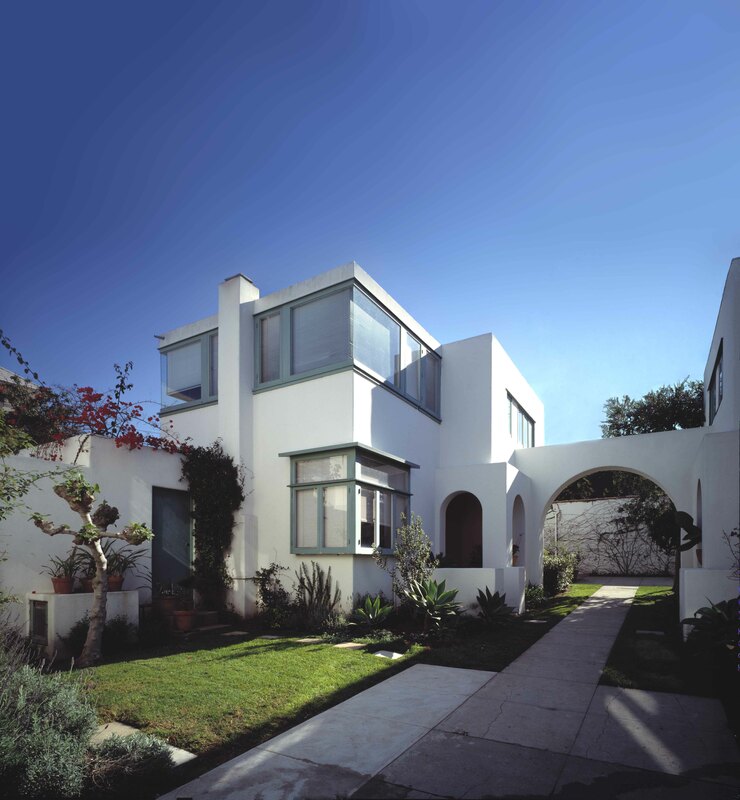 WE WERE ALL IN AGREEMENT TO RESTORE THE ORIGINAL DESIGN OF IRVING GILL . BUT EVERYBODY WENT THEIR SEPARATE WAYS OF WHAT THAT WAS. STEPHEN TOOK A RELAXED APPROACH AND BUILT IN FURNITURE WITH A ITALIAN MODERN SLANT. DESTROYING ORIGINAL CABINET DESIGN ETC. IT WAS OBVIOUS TO ME THAT THE SLEEPING PORCHES ON THE SECOND FLOOR WERE ENCLOSED AT A DIFFERENT TIME THAN THE ORIGINAL DESIGN. OPEN SLEEPING PORCHES BEING THE CRAZE AT THAT TIME. OUR HOUSE WAS IN THE BACK ON THE OCEAN SIDE. WE HAD A PANORAMIC VIEW OF THE OCEAN FROM THE ENCLOSED PORCH. NOW A HUGE CONDO COMPLEX BLOCKS THAT VIEW. THE DETAILING OF OUR WINDOWS WERE NOT AS ELABORATE AND INTERESTING AS THE FRONT UNITS. SO I DESIGNED MITERED CORNER GLASS USING THE EXISTING COLUMNS LOCATION TO CANTILEVER THE ROOF. HAMLIN EMORY HAD THE OTHER REAR UNIT AND DID LIKEWISE. THE BACHS STOOD FIRM WITH WHAT THEY HAD . THEY ON THE STREET. SO EVEN THOUGH SLEEPING ROOMS FENESTRATION WAS DIFFERENT, THERE WAS CONSISTENT UNIT PAIRING . MILICA’S AND MY THINKING BEING THAT WE WERE NOT SURE IRVING GILL DESIGNED THE WINDOWS AND ROOFS OF THE ENCLOSED PORCHES. AND IF HE HAD, IT WAS A CRUDE ADD ON . THE CONSTRUCTION AND DETAILING ROUGH COMPARED TO THE REST OF THE HOUSE. CRUD EXPOSED RAFTERS AND WOOD DECKING. ALL THAT CHANGED WITH OUR DESIGN. MILICA CALLING IT THE ITALIAN APPROACH. THE KITCHENS WERE OPEN TO ANY DESIGN. JUST AN OPEN SPACE THAT I DID A ONE WALL NUMBER ON. CHARLES MOORE AND I DISCUSSING MY DESIGN AT AN OPEN HOUSE. DANILO TELLING ME RECENTLY THAT HE HAD PROOF THAT THE CUDE ROOFS OVER THE SLEEPING PORCHES WERE PART OF THE ORIGINAL DESIGN. ANYWAY, ESTHER MC COY FEATURED OUR UNIT WITH MITER GLASS CORNERS IN THE PROGRESSIVE ARCHITECTURE MAGAZINE, AND MARVIN RAND’S RECENT BOOK ON GILL PUT HAMLIN EMORY’S HOUSE WITH THE SAME MITER GLASS DETAILING ON THE COVER OF HIS BOOK. AHDE LAHTI, MY CLOSE FRIEND THAT I TAUGHT WITH AT SCI-ARC, DID THE GRAPHIC LAY OUT FOR MARVIN RAND’S BOOK, AHDE SAYING THERE WAS NO MENTION OF THE MITER GLASS NOT BEIING GILL. I TRIED TO GET THE FRONT UNITS TO GO ALONG, BUT THE BACHS HELD FAST TO WHAT THEY HAD, AND CLEANED IT ALL UP. PROBABLY JUST AS WELL, BECAUSE IT GAVE THE TWO LOOKS. I BEING CHASTISED BY AN ENGLISH ARCHITECT FOR TAKING THE LIBERTY TO CHANGE THE DESIGN. BUT THE RESULT OF BOTH APPROACHES LOOKS EXQUISITE. ONE OF THE FIRST THINGS WE HAD TO DO WAS CREATE A FENCE TO PROTECT THE COMPLEX. I DESIGNED THE STEEL OPEN FENCE AND OVER SAW THE INSTALLATION . NOBODY HAS EVER QUESTIONED IT WAS NOT DESIGNED BY IRVING GILL. I SHOULD BE CONGRATULATED ON THAT ONE. CHECKING THE RECENT PHOTOS, IT SHOWS THAT PART OF THE FENCE I DESIGNED HAS BEEN REMOVED FROM THE TOP OF THE STREET WALLS. THIS CHANGE ENCOURAGES PLANTS TO DRAPE DOWN OVER THE WALLS, WE WANTED SECURITY . THE NEW FENCE SEGMENT DOES NOT RESPECT THE IMPORTANT WRAP AROUND CORNER OF THE HOUSES. PLUS THE GATES OFF THE PATIOS ALLOWED DIRECT ACCESS TO HEAD OFF TO THE BEACH OR ENTER THE HOUSES, WHICH WE WERE TRYING TO PROTECT. 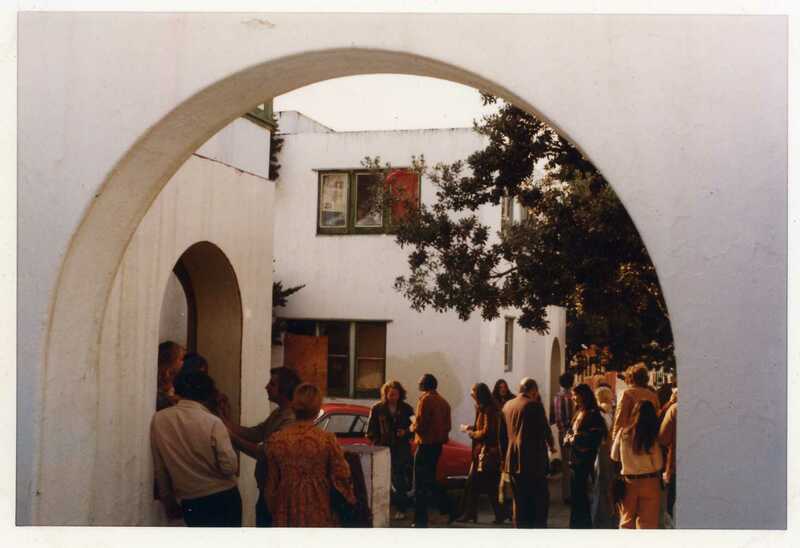 WHAT WAS SENSATIONAL ABOUT LIVING IN OUR IRVING GILL HOUSE WAS THE TIGHT COZY ROOMS. THE LIVING ROOM FIRE PLACE A WARMING AND VISUAL DELIGHT. THE HALLS AND STAIRS TIGHT. NO TRIMS OR KICK BOARDS. THE WINDOWS AND SKYLIGHTS AT THE RIGHT SPOTS. GILLS FLOORS HE WANTED TO APPEAR AS LEATHER. THE KITCHEN AND SERVICE AREAS AT THE CORRECT SPOTS WITH OUTDOOR ACCESS. THERE WAS AN ENCLOSED PATIO OFF THE DINING ROOM. ALL PRIVATE AND WELL LITE. AS FAR AS I AM CONCERNED THIS WAS GILL’S BEST PROJECT. THE COMMON SPACES FLOWED AND BROUGHT PEOPLE TOGETHER. IT WAS A DELIGHT LIVING THERE. THE COMPLEX WAS NOT PRETENTIOUS IN ANY WAY, AND YET HAD ENOUGH SPACE TO DO ALMOST ANYTHING. AFFORDABLE HIGH END DESIGN. A LESSON YET TO BE LEARNED. 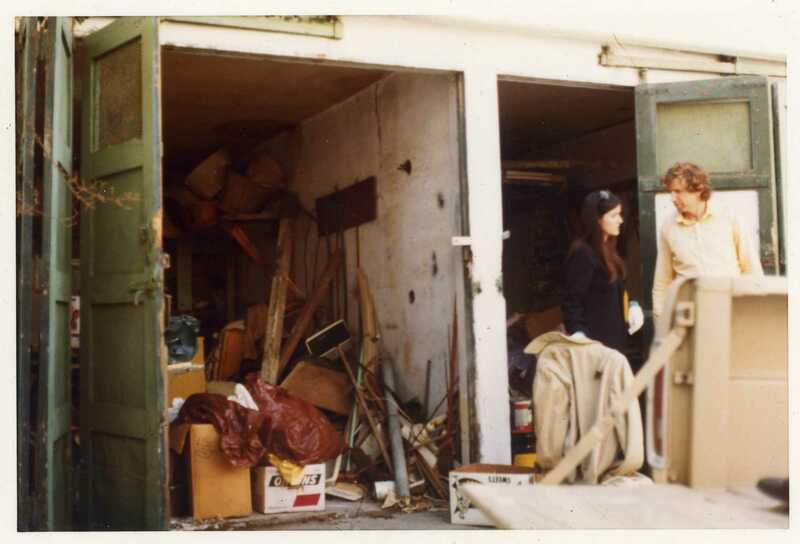 THE DRIVEWAY TO REACH GARAGES IN THE BACK WAS ABANDONED, DUE TO THE IMPOSSIBLE TURNING RADIUS FOR CARS, AND ONE GARAGE NO LONGER PART OF THE PROPERTY. THE DARAGE ADDED BY OTHERS AFTER THE INTIAL GILL DESIGN. JOHN SOUZA ARCHITECT, A STUDENT AT SCI-ARC DURING THE REMODEL, STILL HAS A RENTAL APARTMENT OVER ONE OF THE GARAGES IN THE BACK. 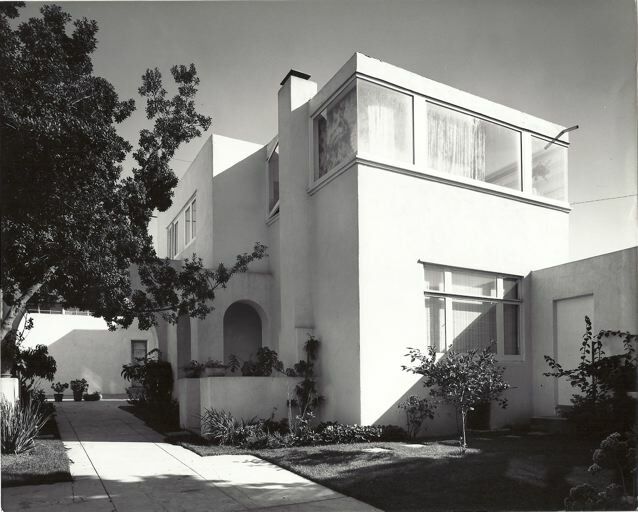 BUT I WAS DOING THE BIOMORPHIC BIOSPHERE AT THE TIME, AND WHEN PEOPLE CAME TO THE DOOR AND KNOCKED, THEY WANTED TO SEE IRVING GILL, NOT GLEN HOWARD SMALL. 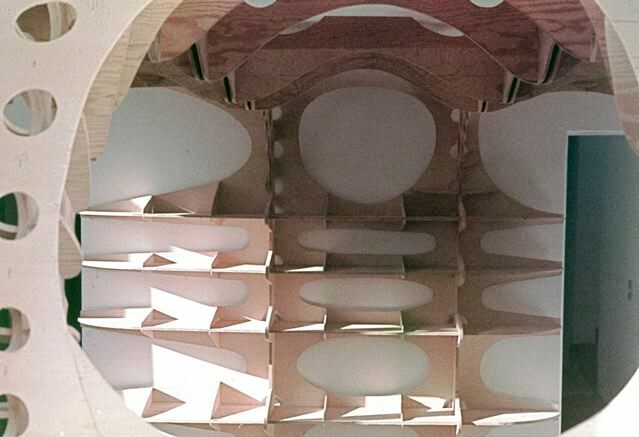 SO I TOOK MY OFFICE SPACE AND BUILT A WOODEN BIOMORPHIC PIECE OF OFFICE FURNITURE THAT I NEVER COMPLETED, BUT WAS AN EXAMPLE OF WHERE MY HEAD WAS AT. MILICA PUT TIE DYE CURTAINS UP IN THE SLEEPING PORCH ROOM, THAT WE TOOK A BIT OF FLAX FOR DOING SO, BUT IT WAS MAGICAL WITH THE SUN, COLORS AND PATTERNS AND OCEAN VIEW. i APOLOGIZE FOR NOT HAVING PHOTOS OF THE RESORED INTERIORS. MAYBE YOU SHOULD KNOCK ON A DOOR AND TAKE A PEAK. I FINALLY RENTED A MAGNIFICENT STUDIO ON THE BEACH IN VENICE DESIGNED BY THE ARTIST ED MOSES WITH INPUT FROM FRANK GEHRY, THAT MILICA AND I AND OUR TWO YOUNG CHILDREN YASMINA AND ERIK LIVED IN, ALL HIGH CEILING AND OPEN , JUST THE OPPOSITE OF IRVING GILL, THE ONLY SPACE I HAVE EVER BEEN IN THAT EXHIBITED MY WORK . EVENTUALLY BUYING A LOT IN VENICE AND BUILDING A MONUMENT HOUSE THAT MILICA DESIGNED, HAVING A BIT OF MY INPUT. ” BUY LOW AND SELL HIGH” WAS WHAT WE DID WITH THE HORATIO WEST COURT APARTMENTS. THAT FINANCED OUR NEW VENICE MONUMENT STUDIO HOUSE . SEEING RECENTLY THIS STUDIO HOUSE ABUSED BY NEW OWNERS PUTTING A ROOF ON THE GREEN HOUSE. TWO YEARS AFTER WE SOLD HORATIO THE OTHER PARTNERS CASHED IN AT THREE TIMES WHAT WE GOT. WE MISSED THE HIGH. YES THIS IS CALLED GENTRIFICATION. ALL AMERICANS RAISED TO DO SO. NOW THAT I AM FINANCIALLY BUSTED. I HAVE TO FIGURE OUT WHAT IS CORRECT. THE BEST PART WAS WE RESTORED HORATIO WEST COURT APARTMENTS FOR ALL TO SEE, AN IMPORTANT PART OF ARCHITECTURAL HISTORY. THE ADJOINING HOUSES RAZED, AND MAXIMUM DENSITY APARTMENTS AND CONDOS BUILT. GILL’S MASTERPIECE DODGE HOUSE IN LA WAS NOT SO LUCKY. IT GOT TORN DOWN IN THE NAME OF MONEY. 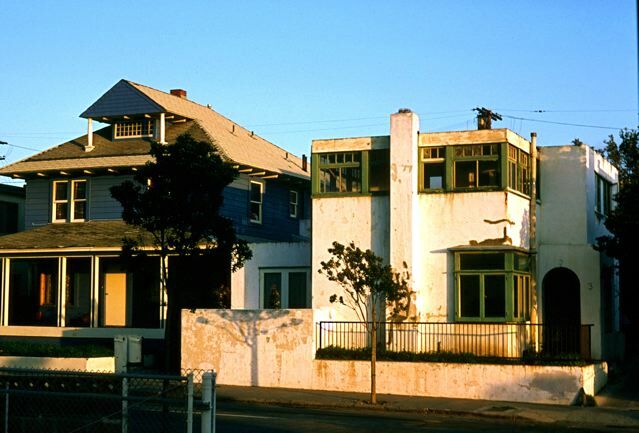 LA LACKING THE CULTURE TO SUPPORT HISTORICAL PRESERVATION EVEN THOUGH THE FIGHT WAS FIERCE TO SAVE. 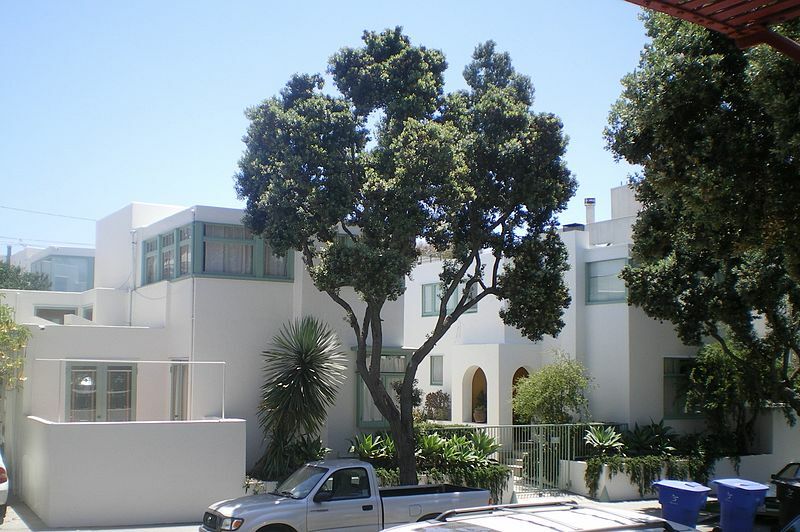 Glen, many thanks for revisiting the Horatio West Court chapter in our lives — it was an adventure — we were young and fearless and brought an Irving Gill masterpiece back to life! margaret thanks for your comments. it was a great time, and i was oblivious to what we were really doing. now looking at the complex and remembering what we had initially to work with, and the limited funds to remodel and restore things, it was amazing we pulled it off. also as i remember, there was some disagreement, but no real mean behavior. i think the group got along quite well. but now i realize we should have interacted more. all of us in states of putting our professional lives together. we can now have a real conversation, since we sorted out life and have moved on. i am sure there are other projects in danger that could be saved by a private shared group that could buy, live, and restore. the sixties and seventies have seen tons of monuments torn down or destroyed with a remodel. talking to ray kappe that built a lot of monument houses, he saying the rich feel entitled to do what ever they want. he losing a lot of houses to the present culture. there were a ton of sensitive apartments designed at the time that have been lost, but i am sure if one pokes around they can find them. a good place to start is with allyn morris projects, which i wrote a blog on upon his death a couple of years ago. michael falonis can give you a list of his monument condo projects. i have the grant wada eco condos that could use some help to go back to eco. i am sure you have some more suggestions margaret. i must say you are an amazing kind intelligent person, keep your drive. I WAS A BIT DISAPPOINTED THAT THERE WERE NOT MORE COMMENTS CONCERNING THIS BLOG. 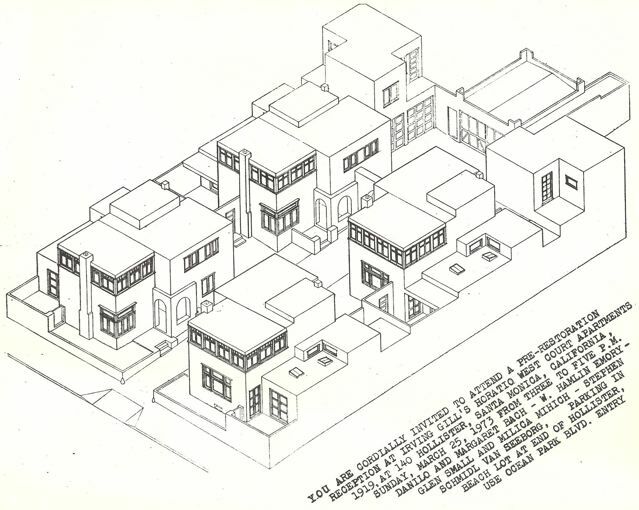 I KNOW YOU ARE OUT THERE, AND PROBABLY DEAL WITH THE SAME ISSUES IRVING GILL DID. THIS WAS 1919 , 95 YEARS AGO. IS THERE NOT SOME REPECT FOR THE MAN? Came across your blog when I was doing research on Horatio West Court. Thank you so much for taking the time to write this. Fascinating. Do you know who it was originally built for? Wow. This is an outstanding bit of local history and I am grateful for my student Erika, who came across it and shared it with our class. 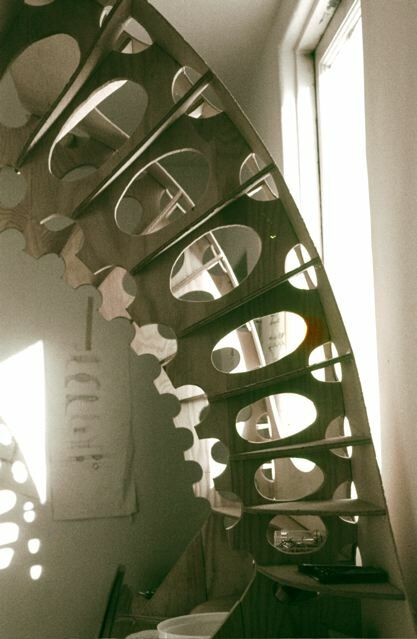 I am circulating this link to everyone I know in the Architecture community (SCI-arc and more). Thank you Glen Small and friends for fearlessly saving Horatio West Court and sharing your photos and memories of this time. Amazing photos and story! I hadn’t realized that this building was in such desperate condition when you rescued and restored it. You must have been the first to recognize the potential and importance of restoring Irving Gill’s work and succeed in doing it. What a turn around! The steel fence you designed for the property to keep vagrants out now keeps architecture tourists and Gill enthusiasts out…how could anyone live there other wise. I think the likely reason you have not had more traffic and comments on this story is that neither the title of the piece or of the blog include “Irving Gill” or “Horatio West” and doesn’t have any tags or key words. Thus it doesn’t come up anywhere near the top of the list on a Google search. I’m not a blog expert but I think if you change the title and add tags it will eventually be found. I’ve been looking up images and articles from the publications of Gill’s work. I’ve not found anything for Horatio West, but attached is a great view of the Dodge house. Wow — the first thing I want to write is THANK YOU!!! Irving Gill is one of my favorite architects, and the Horatio West Court is one of my favorite structures. I first saw it in the 80’s and remember just standing across the street staring at it in amazement. In fact, whenever I am back in LA I make a point of visiting the project. I have always wondered who was responsible for the restoration — as you point out, Horatio West Court could so easily have gone the way of the Dodge house. I only came across your web site just now and wish I had been able to post earlier. Your history of the restoration is exactly the missing piece of the puzzle I’ve been trying to learn about for so long. Again, thank you and your colleagues so much for saving this — we are all so lucky that you and your friends had the vision and insight to preserve this masterpiece.